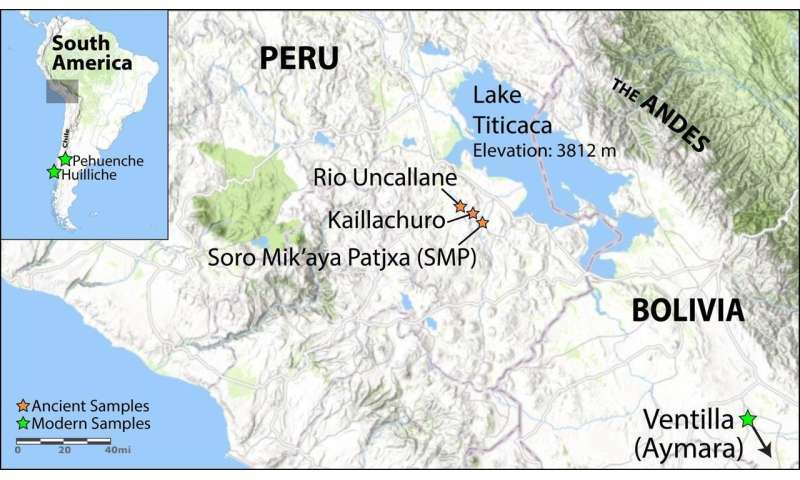 A multi-center study of the genetic remains of people who settled thousands of years ago in the Andes Mountains of South America reveals a complex picture of human adaptation from early settlement, to a split about 9,000 years ago between high and lowland populations, to the devastating exposure to European disease in the 16th-century colonial period. Led by Anna Di Rienzo, Ph.D., and John Lindo, Ph.D., JD, from the University of Chicago; Mark Aldenderfer, Ph.D., from the University of California, Merced; and Ricardo Verdugo from the University of Chile, the researchers used newly available samples of DNA from seven whole genomes to study how ancient Andean people—including groups that clustered around Lake Titicaca in Peru and Bolivia, 12,000 feet above sea level—adapted to their environment over the centuries. In the journal Science Advances, they compared their seven historical genomes to 64 modern-day genomes from a current highland Andean population, the agropastoral Aymara of Bolivia, and the lowland hunter-gatherer Huilliche-Pehuenche in coastal Chile. The goals were (1) to date the initial migration to the Andean highlands, (2) to identify the genetic adaptations to the high-altitude environment that allowed that settlement, (3) to estimate the impact of the European contact starting in the 1530s that caused the near annihilation of many lowland communities of South America. 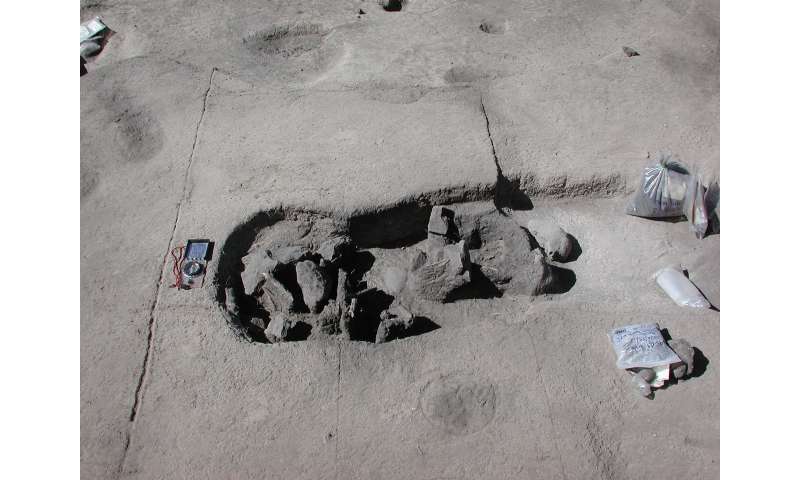 "We have very ancient samples from the high Andes," said Di Rienzo. "Those early settlers have the closest affinity to the people who now live in that area. This is a harsh, cold, resource-poor environment, with low oxygen levels, but people there adapted to that habitat and the agrarian lifestyle." The study, "The Genetic prehistory of the Andean highlands 7,000 years BP through European contact," uncovered several unexpected features. The researchers found that highland Andeans experienced much smaller than expected population declines following contact with European explorers who first came to South America in the 1530s. In the lowlands, demographic modeling and historical records infer that up to 90 percent of residents may have been wiped-out after the arrival of Europeans. But the people living in the upper Andes had only a 27-percent population reduction. Even though the highlanders lived in altitudes above 8,000 feet, which meant reduced oxygen, frequent frigid temperatures and intense ultra-violet radiation, they did not develop the responses to hypoxia seen in natives of other high-altitude settings, such as Tibet. 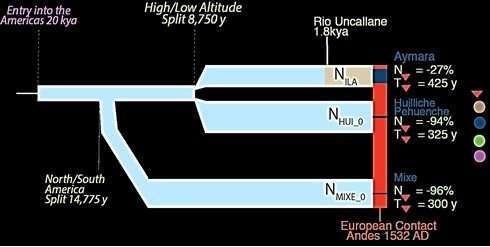 The Andeans may have adapted to high altitude hypoxia "in a different way, via cardiovascular modifications," the researchers suggest. They found evidence of alterations in a gene called DST, which is associated with the formation of cardiac muscle. Andean highlanders tend to have enlarged right ventricles. This may have improved oxygen intake, enhancing blood flow to the lungs. But the strongest adaptation signal the researchers found was in a gene called MGAM (maltase-glucoamylase) an intestinal enzyme. It plays an important role in the digestion of starchy foods such as potatoes—a food native to the Andes. A recent study suggests that the potato may have been domesticated in the region at least 5,000 years ago. Positive selection on the MGAM gene, the authors note, "may represent an adaptive response to greater reliance upon starchy domesticates." The early presence of this variant in Andean peoples suggests "a significant shift in diet from one that was likely more meat based to one more plant based," said UC Merced's Aldenderfer, an anthropologist. "The timing of the appearance of the variant is quite consistent with what we know of the paleo-ethno-botanical record in the highlands." Although Andean settlers consumed a high-starch diet after they started to farm, their genomes did not develop additional copies of the starch related amylase gene, commonly seen in European farming populations. A comparison of the ancient genomes with their living descendants also revealed selection for immune-related genes soon after the arrival of Europeans, suggesting that Andeans who survived may have had an advantage with regard to the newly introduced European pathogens. "Contact with Europeans had a devastating impact on South American populations, such as the introduction of disease, war, and social disruption," explained Lindo. "By focusing on the period before that, we were able to distinguish environmental adaptations from adaptations that stemmed from historical events." "In our paper," said Aldenderfer, "there was none of this prioritization of genes at the expense of archaeological data. We worked back and forth, genetics and archeology, to create a narrative consistent with all of the data at hand." I would imagine it is likely that the high altitude population had retreated there in prior plague times, which will happen when you get large masses of people together and doing business and trade (or war) with other City-States or Nations, and if there is no proper sewage system built to handle the effluent (such as Greeks and Romans devised) then plagues would be a common enough thing. And survivors would try to get as far away as possible. Moving to the highlands, they, being the survivors of previous plagues, may have had the better, survival genome to deal with various plagues before the Europeans showed up with their whole trove of new diseases and plagues. Of course, they took home, with them, the plagues from the New Lands as well. Could be they will be the ones to survive should the Northern Hemisphere powers collide violently. They will just live their simple lives and keep Humanity going and there will always be the adventurous sort to leave and explore. It's a good guess, but incorrect. The population centers of the region were always in the highlands since the coast is the Atacama Desert. Anywhere in the Atacama that isn't irrigated more closely resembles the surface of the moon than any other desert on Earth, there are **no** resources available to survive on. In the highlands there was a rich melange of foodstuffs available, including potatoes, quinoa, legumes, squashes, guinea pigs, alpaca, corn, and fish (as well as lesser-known foods like oca and kiwicha). To the east lay the vast expanse of the Amazon, which had a thriving population but which seems to have stayed to itself outside of some trade. There doesn't seem to have been much if any population interchange between the Amazonian peoples and those of the highlands. Even the Inca only penetrated the "ceja de selva" above 2400 meters. Almost all the dominant cultures in the region came from the highlands above 2000 meters and spread west and east. Lake Titicaca is amazing in itself, That area has a mysterious aura. Nice read. The "Cloaca" was such a civic treasure. The Romans proudly took the tourists had to see it, er, smell it? Truly a glamour for The Ages! No plagues or famines ever struck the Greeks or Romans. Do you know how difficult it is to say anything as ridiculous as that and not burst a gut laughing? Population pressure and certain disease vectors can still cause plagues even with decent sewer systems, but even today bad sewage systems, as open air gutters and sewage ditches common in 3rd world villages and slums, still kill tens of thousands annually. Comparatively the South American people lived much cleaner than did the Spaniards, bathing regularly etc with well developed sewage systems. The Spaniards, by comparison, brought the cities and tows down to the level of slums due to the plagues that the Spaniards let loose, such as the smallpox etc. Most of the first connection to the Andes was from the South East and the North, in Equador and followed the Andean trade routes on their road system. The lowlands people were largely decimated by plague, many whole districts were destroyed. This study shows the Highland Folks were separate, and survivor type, likely driven from the Amazon side to the heights to avoid plague in ancient times, as plague historically always arises. The High Plains peoples certainly did trade with the coastal peoples, as salted dried fish was a trade item, corn from the highlands dried and parched and traded as well as dried fruits, nuts and animal products from the Amazon side. Hemp for rope, clothing, seeds and oil is a well traded crop as well and grows best in the lowlands. The trade routes we are finding to have been very extensive and not just limited to the highlands and pampas. The relatively immune populations could have been the genetic repository stock that re-filled the lowlands periodically with an admixture of the coastal peoples and any of the Polynesian types that were always looking for new lands, new peoples and adventure. Fairly standard human nature, and would explain the divergence between highlanders and lowland folks. The Spanish were dirty folks at the time, regularly throwing waste to the streets in crude sewers, or honey carts if the town was rich and smart, to use it for their farms instead.